Special Adviser to the governor on media and publicity, Mr Opunabo Nko-Tariah in a statement yesterday in Port Harcourt alleged that there had been effort to wrestle power from Governor and Wike through the back door, adding that legal steps will be taken to defend the mandates of the people displayed in the April 11 general election. 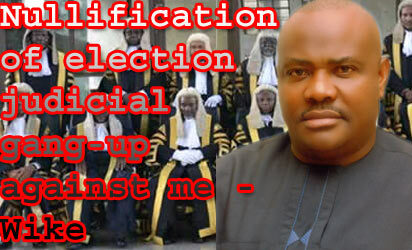 Governor Nyesom Wike, described the nullification of his election by the Election Petition Tribunal as a gang up against him as he told the people of the state, arguing that the the judiciary was setting a dangerous precedent in the country with the way it had gone about elections in Rivers state. “The courts are setting pernicious precedents by hinging their verdicts on inane points. Rivers people overwhelmingly gave their mandate to me but a microscopic few want to wrestle that mandate from me through the back door”. Meanwhile, the governorship candidate of the All Progressives Congress, APC in the April election, Dr. Dakuku Peterside, has condemned the denigration of the judiciary by Governor Nyesom Wike, his agents and the Peoples Democratic Party, PDP. Peterside who spoke in Abuja said the vilification of an important arm of government like the judiciary by desperate politicians portend grave danger for Nigeria and her budding democracy. He described the disparagement and on-going war against the judiciary by Wike and the PDP as a dangerous example that must be checked quickly because of its calamitous consequences. “The judiciary is a sacred and respected institution. Therefore, any person or persons who openly criticise judges and their rulings obviously have a sinister motive. “However, it is gratifying to note that people are beginning to fully appreciate the character and temperament of the people we engaged during the last general elections in Rivers State. They are obviously finding it difficult to live under due process and the rule of law because they are used to impunity and violence, the two evils that were taken to new heights under the last government. “If service is really the reason for being in politics, then it is tragic that these politicians are conducting themselves in such a spiteful manner. Nobody is above the law and when people openly and brazenly challenge institutions of state like the judiciary, it sends the wrong signal. “The APC in Rivers State and its candidates took their losses at the various election petitions tribunals with equanimity, knowing fully well that a window of opportunity still exists. Even when we felt very dissatisfied with the verdicts, we still did not abuse the judiciary or judges who handled our cases because we know the consequences of such defamatory actions. “Wike and Rivers PDP are still living in the past, but they should be reminded that Nigeria of today is a survivor, because she defeated impunity and all the lawlessness of the last administration”.